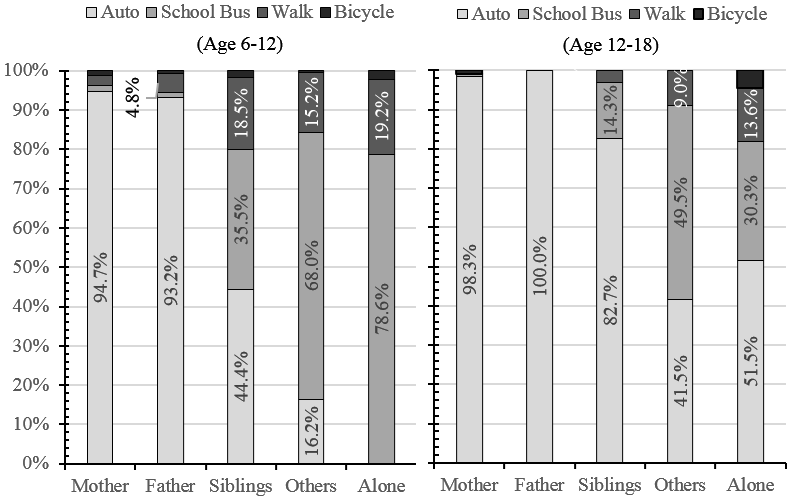 This paper tests a group decision-making model with altruism to examine the school travel behavior of schoolchildren aged between 6 and 18 years in the Minneapolis-St. Paul metropolitan area. The school trip information of 1,737 two-parent families with a schoolchild is extracted from Travel Behavior Inventory data collected by the Metropolitan Council between the Fall 2010 and Spring 2012. The proposed model has four distinctive characteristics compared with traditional developed models in the field of school travel behavior including: (1) considering the schoolchild explicitly in the model, (2) allowing for bargaining or negotiation within households, (3) quantifying the intra-household interaction among family members, and (4) determining the decision weight function for household members. This framework also covers a household with three members, namely, a father, a mother, and a schoolchild, while unlike other studies is not limited to dual-worker families. To test the hypotheses, we developed two models with and without the group-decision approach. Further, the models are separately developed for different age groups, namely schoolchildren aged between 6-12 and 12-18 years. This study considered at a wide range of variables such as work status of parents, age and gender of students, mode of travel, and distance to school. The findings of this study demonstrate that the elasticities of two modeling approaches are different not only in the value, but in the sign in some cases. In more than 90 percent of the cases, further, the unitary household model overestimates the results. More precisely, the elasticities of unitary household model are as large as 2 times more than that of the group-decision model in 25 percent of cases. This is a direct consequence of model misspecification that misleads both long-term and short-term policies where the intra-household bargaining and interaction is overlooked in travel behavior models.